Select the direction of travel, the day of the week and the time of day for travel and click "Submit." NOTE: not all routes operate seven days a week. Results may vary due to the time and day of the week selected. » The first line shows the header sign information to be found on the front of the bus/train. 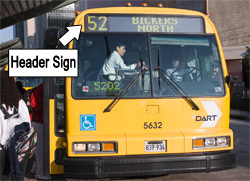 The block number in [brackets] is also displayed on the front of the bus. The second line shows the origin stop scheduled departure time and the destination stop scheduled arrival time. » If you frequently use a route, bookmark the results page in your browser to conveniently view the selected day and time of travel anytime you need the information.